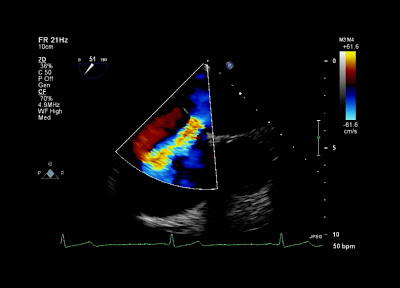 In our blog a few days ago, we looked at the first heart sound and how it varies with different clinical conditions. In today's blog, we're going to take a look at S2, the second heart sound. P2, caused by pulmonary valve closure. In expiration, the A2 and P2 components are virtually indistinguishable (in adults) and are essentially heard as a single sound. However in inspiration, the increase in venous return to the right heart slightly delays right ventricular emptying, which in turn slightly delays P2. Thus in inspiration we hear normal physiological splitting of the second heart sound, with P2 occurring just after A2. This physiological splitting of the second heart sound gets wider (and therefore easier to auscultate) if P2 occurs late - this happens in right bundle branch block (because of the later contraction of the right ventricle), and also in pulmonary stenosis (due to greater impedance to right ventricular emptying). As you might expect, splitting of the second heart sound also gets wider if A2 occurs early - this is seen with mitral regurgitation, and also in ventricular septal defect, because left ventricular emptying occurs more quickly. The splitting of the second heart sound becomes reversed (i.e. A2 occurs after P2) if emptying of the left ventricle is delayed - as occurs in left bundle branch block or aortic stenosis. When reversed splitting occurs, it's easiest to hear in expiration. Fixed splitting of the second heart sound occurs in the presence of an atrial septal defect. In this situation, pressure changes with respiration affect the right and left atria equally, and so we no longer see the delay in P2 that normally occurs during inspiration.